Among small songbirds, the chickadee's black cap and bib, white cheeks, gray back, wings, and tail, and whitish undersides with buffy flanks are distinctive. It's difficult to distinguish on sight from the Black-capped Chickadee, which rarely if ever occurs in Northern Virginia. The common Carolina species has a higher four-note song, sounding like "fee-bee, fee-bay", while the other species sings a lower two-note one. Both birds use the "chick-a-dee-dee" call, often in warning, and the length of the call may indicate the level of threat the bird feels. 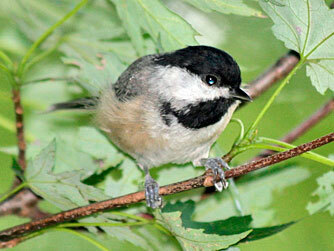 As its name suggests, the Carolina Chickadee is an inhabitant of the warmer parts of eastern North America. It can be found in lowland forests, woodlands, suburbs, and city parks - almost anywhere there are large trees. Normally it feeds on insects, spiders, seeds and berries that it finds on those trees, often hanging upside down from a branch to pluck its food. 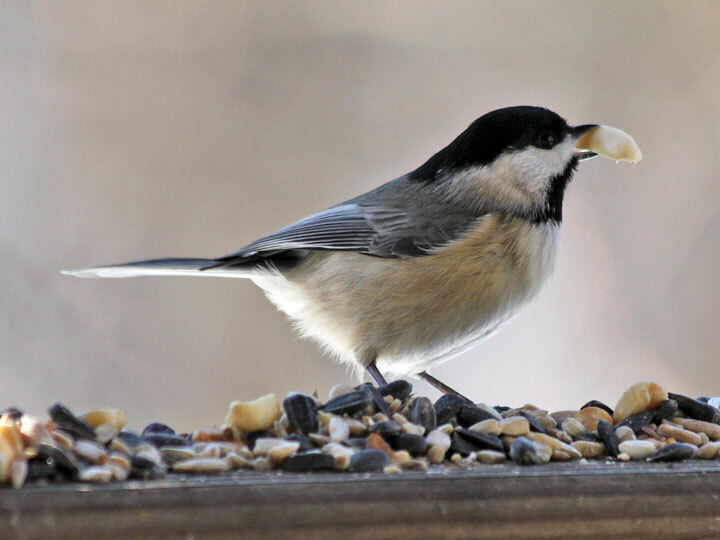 Chickadees also come readily to feeders, particularly in winter, when they join with other small birds such as titmice, nuthatches and kinglets, to forage in groups. 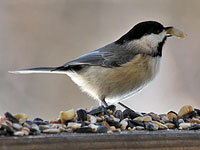 The chickadee will not stay at the feeder, though, but fly to a nearby branch and eat the seed or nut there by itself. 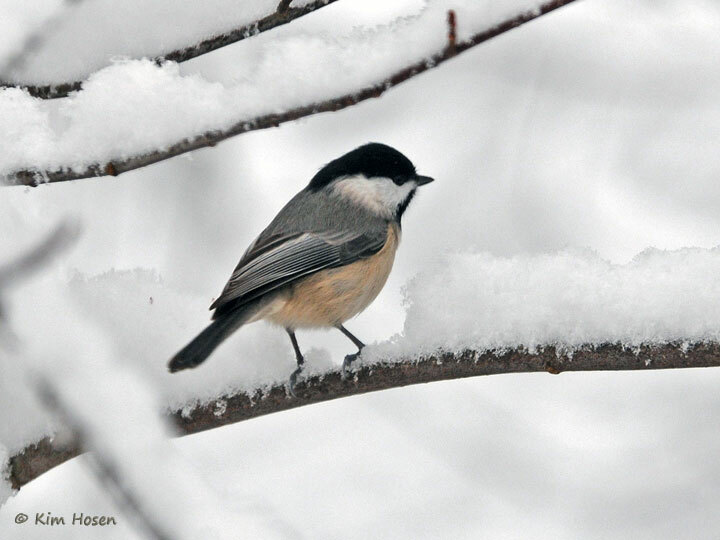 Carolina Chickadees are year-round residents, and pairs may remain together for several years. They sleep or shelter from the cold in small cavities they find in trees, such as former Downy Woodpecker holes, or that that they dig in dead trees. Both birds excavate the hole, usually in a place selected by the female, and half a dozen or so small white eggs are laid in a nest of moss and hair. They will also use nest boxes.